Air Force Students Soar at UA Little Rock! On December 16, 2016, UA Little Rock opened the Military Student Success Center. The Center was made possible through the generosity of a grant from the Student Veterans of America and Home Depot along with the support from campus leaders, Veterans, students, and Veterans Villages of America. 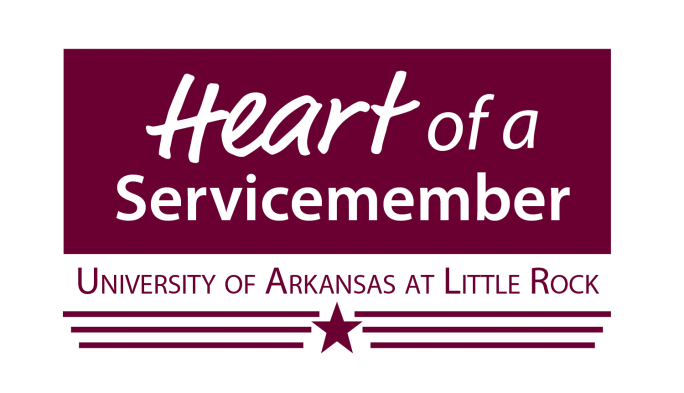 UA Little Rock has the honor of being a Purple Heart University. Air Force students may now take their General Education Mobile classes through UALR to get their Community College of the Air Force degree and then continue on seamlessly to their bachelor’s degree in the AU-ABC partnership. 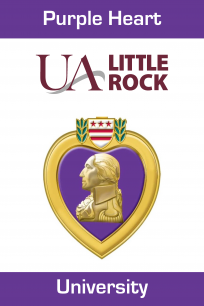 UA Little Rock has signed the Voluntary Education Partnership Memorandum of Understanding (MOU) and adheres to the Principles of Excellence to help Servicemembers and their adult family members earn college degrees. UA Little Rock is also a member of the Servicemembers Opportunity Colleges (SOC) an organization that provides educational opportunities to the women and men of the Armed Forces. A dependent1 or spouse of a veteran under paragraph 1. A member of the armed forces. A spouse of a member of the armed forces. demonstrates a change of bona fide domicile from another state to Arkansas at least twelve consecutive months prior to separation, discharge, or retirement from active military duty. This provision is forfeited if the military person does not return to Arkansas within 36 months after separation, discharge, or retirement from active duty. A veteran using educational assistance under either Chapter 30 (Montgomery G.I. Bill– Active Duty Program) or Chapter 33 (Post-9/11 G.I. Bill), of Title 38 of the United States Code, who lives in the State of Arkansas while attending a school located in the State of Arkansas (regardless of his/her formal state of residence) and enrolls in the school within three years of discharge from a period of active duty service of 90 days or more. A spouse or child using transferred Post-9/11 G.I. Bill benefits (38 U.S.C. §3319) who lives in the State of Arkansas while attending a school located in the State of Arkansas (regardless of his/her formal state of residence) and enrolls in the school within three years of the transferor’s discharge from a period of active duty service of 90 days or more. A spouse or child using benefits under the Marine Gunnery Sergeant John David Fry Scholarship (38 U.S.C. §§3311(b)(9)) who lives in the State of Arkansas while attending a school located in the State of Arkansas (regardless of his/her formal state of residence) and enrolls in the school within three years of the Service member’s death in the line of duty following a period of active duty service of 90 days or more. A person who initially met the requirements set forth in paragraphs 6 7, or 8 will maintain “covered individual” status as long as he or she remains continuously enrolled (other than during regularly scheduled breaks between courses, semesters, or terms) at the same school even if he or she is outside the 3-year window or enrolls in multiple programs. For purposes of a student who is eligible for in-state tuition solely under sections 6, 7, or 8 above, that person must have enrolled in the school prior to the expiration of the three year period following discharge or death described above in sections 6, 7 or 8 and must be using educational benefits under either Chapter 30 or Chapter 33 of Title 38 of the United States Code. A member of the armed forces or “covered individual” as identified in Section 702 of the Veterans Access, Choice and Accountability Act of 2014. If you qualify for in-state tuition as it is listed on this policy, please fill out this form. 1 For the purpose of this policy, dependents are unmarried children who are legal dependents of the military person as defined by the IRS. Beginning March 21, 2014, military students do not have to pay the $40 application fee. When applying to UA Little Rock, military students need to look for the portion of the application that asks about military service. Specific instructions will be provided on the application page. The UA Little Rock Office of Military Student Success is ready to help you through the paperwork jungle in order for you to use the educational benefits that you have earned. Drop by (Speech Building, Room 111), email (military@ualr.edu), or call (501) 682-8387 to set up an appointment today. In 2008, our faculty voted unanimously to accept military credit as academic credit whenever possible. The military credit is any credit that is earned through evaluations performed by the American Council on Education and any other accredited military school such as Air University and the Community College of the Air Force. At a minimum, this military credit will go towards lower-level and/or upper-level elective credit. Whenever possible, military credit will be articulated as an equivalency for academic credit. What does that mean for you? You are able to complete your degree faster. Contact the Office of Transfer Student Services today.Email (transfer@ualr.edu) or call (501) 682-1273 to set up an appointment today. We want your experience at UA Little Rock to be the best. We know that each military member has a unique set of educational goals and we want to help you meet those goals. Let us know how we can help you.